Home »	Uninstall » How to Uninstall 7-Zip? Issue: How to Uninstall 7-Zip? Hello, I’d like to uninstall 7-Zip because I have no idea how to use this tool and I haven’t used it for ages. Can you tell me how to remove this program from my computer? 7-Zip is a legitimate and free file archiver that is used to compress files into archives. The software creates 7z file format archives that can be used to save time and space when moving a large amount of data from one place to another. Such archives come in handy when you need to transfer some files to someone via e-mail or a media sharing site. You can compress your files and send them to another person who will decompress them with 7-Zip or another file archiver that supports 7z or zip format. The software comes with a file manager that has a toolbar that allows creating archives, extracting them, testing archives to detect errors, move, delete and copy files, also open file properties menu. The file manager also allows seeing hidden files. The 7-Zip official website states that the software is capable of compressing files to 7z format from 30 to 70% better than to zip format, and 2 to 10% better to zip format than other programs that are compatible with this file format. The 7-Zip software is compatible with Windows 10/8/7/Vista/XP and also 2012/2008/2003/2000/NT versions. 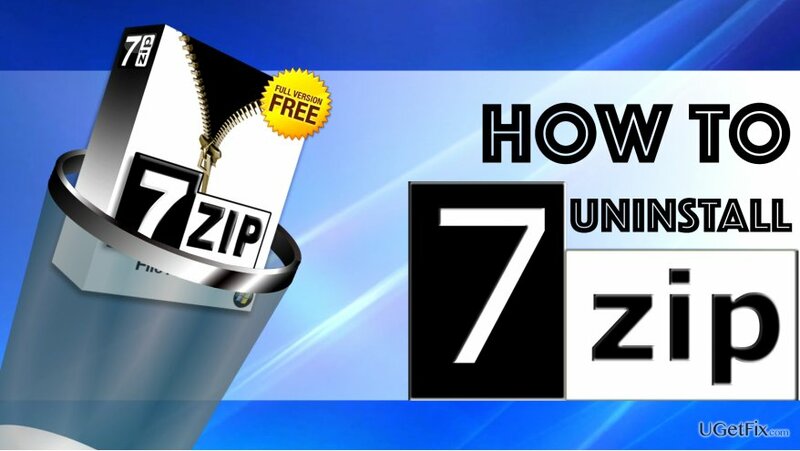 This tutorial explains how to uninstall 7-Zip easily and without facing any errors. Press Control+Alt+Delete at the same time to launch Windows Task Manager. Look through the list of processes and find the ones related to 7-Zip. Select them (one at a time) and click End Process. Repeat until all of the 7-Zip related processes are gone. In Control Panel, you should find a tab named “Startup.” Here, find processes related to 7-Zip, right-click them and select Disable. You can also manage Startup items by going to Control Panel > Administrative Tools > Services. Here, right-click the program you want to disable and select Properties>Stop. Then activate Startup type menu and select Disabled. Go to Control Panel (you can search for it on your PC using Windows search), then to Programs and Features or Add/Remove Programs panel. Select 7-Zip and choose Uninstall. Follow instructions provided by the uninstaller. Repeat with all programs related to 7-Zip. Now, you need to delete 7Zip-related Windows Registry keys. Press down Windows key + R key to launch Run window. Once it opens, type regedit and press Enter. This will launch the Registry Editor. Here, delete this key: HKEY_CURRENT_USER\\Software\\7-Zip. Now, click Edit and select Find… Here, type 7-Zip and press Find next. Remove all keys related to the software you want to uninstall. If these instructions seem confusing to you, or if you simply want to check whether you removed the software correctly, you can use Perfect Uninstaller software to remove 7-Zip remains to you. IMPORTANT. If you received a suspicious 7-zip file via email and it compromised your computer, perform a full system check using Reimage. It will delete malicious files, optimize and freshen up your PC.